Glass is beautiful. Stained or coloured glass is stunning! I’m loving a recent trend of home decorating with stained bottles, coloured glass lamps and tea light holders. Glass vases have always been popular and even exorbitantly priced sometimes. But now the market has also made available, up-cycled glass bottles that might have held perfume or alcohol at some other time. The craftsmanship and detailing of these bottles that we might have ordinary overlooked is now brought to our attention. I bought some of these lovely glass bottles from Home Center. But what I enjoy even more, is up-cycling wine and other alcohol bottles that we buy ourselves. 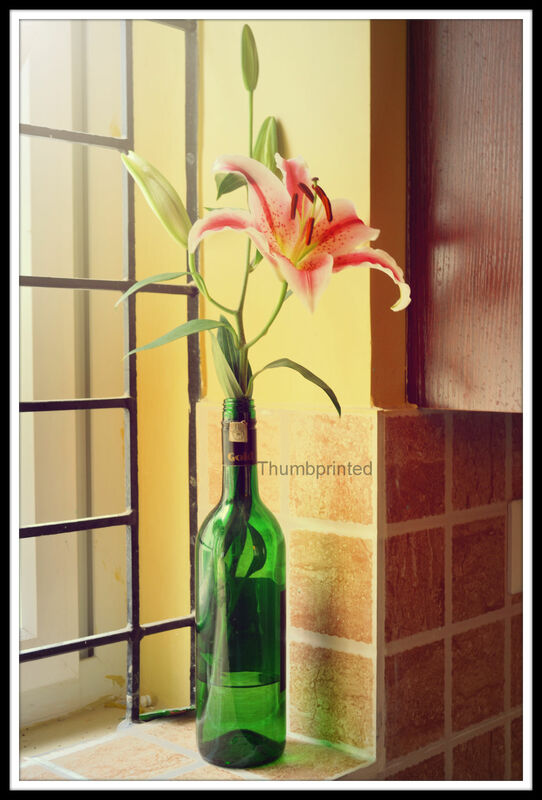 Instead of throwing away these bottles you can turn them into charming vases, some with their shape and graphics exuding a vintage and rustic feel, some modern and edgy and most others just bright and beautiful. A lot of beer bottles and even wine come in green glass bottles. When it comes to glass there is something magical in the usage of colour green, I think it bodes well with the home interiors and exteriors alike and also is any season friendly. It looks fabulous in summer light, mellow and fresh in the monsoons and holds its elegance even during the winters. 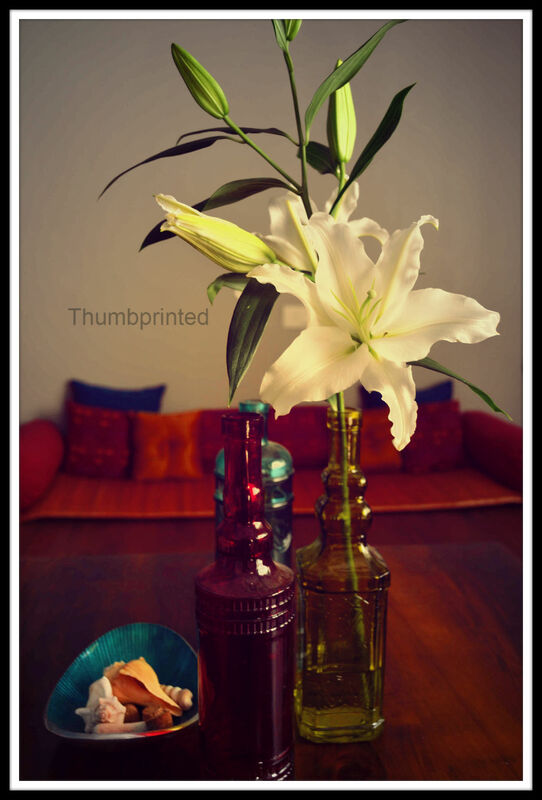 Here are some that is making my home cheerful, at no cost at all! I’m looking forward to using more of these in my terrace garden, the lovely green bottles also look great when teamed up with money plant creepers. The bonus being they are so easy to grow, you just have to fill the bottle with water, break a branch off the creeper and immerse it in the bottle. Happy Decorating! 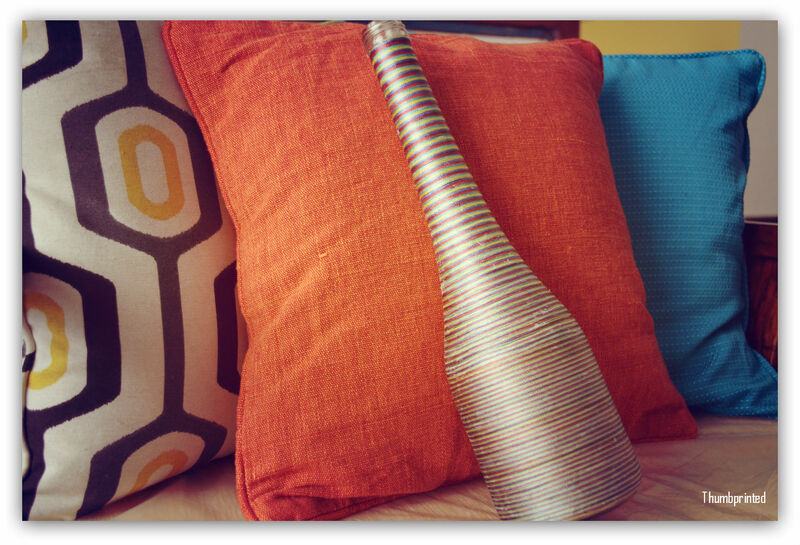 Got plenty of empty glass bottles lying at home, why don’t you up-cyle them to add to your home or garden decor? 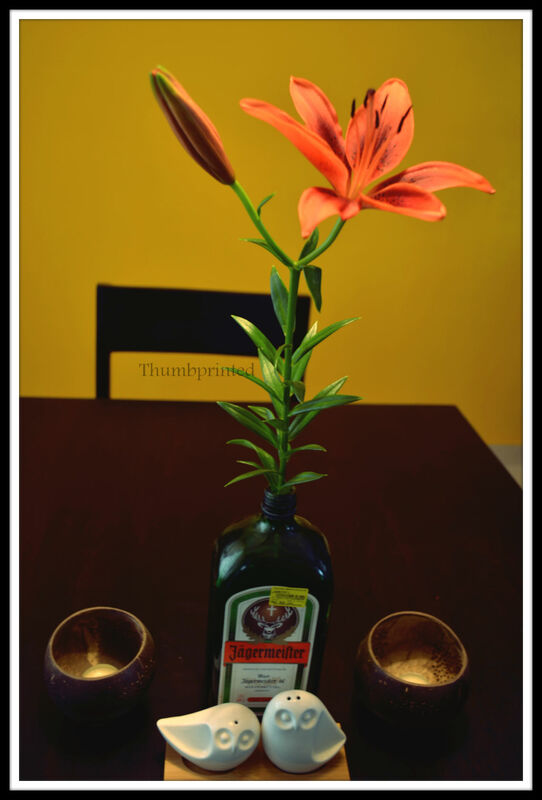 There are many ways you can up-cycle bottles, you can make lamps with them, candle/tea light holders, paint them or do thread work around them. 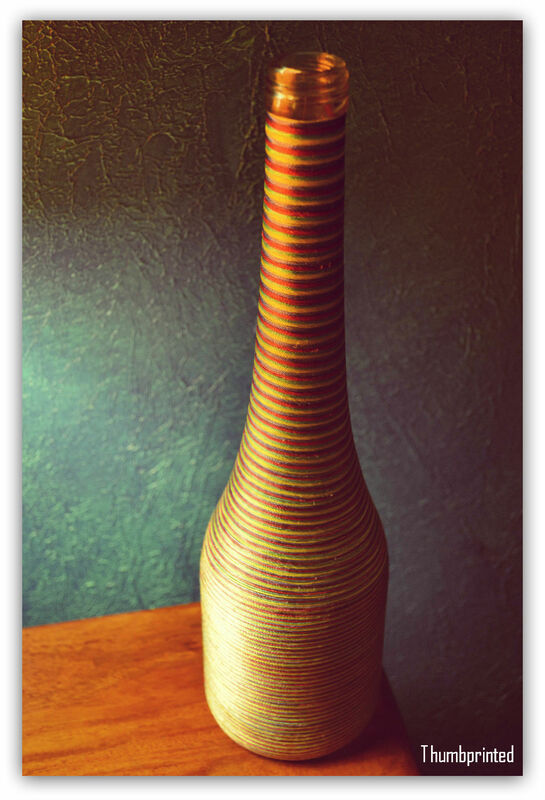 I love this particular form of work and the bottle has a unique look with different threads be it coir or wool or yarn. 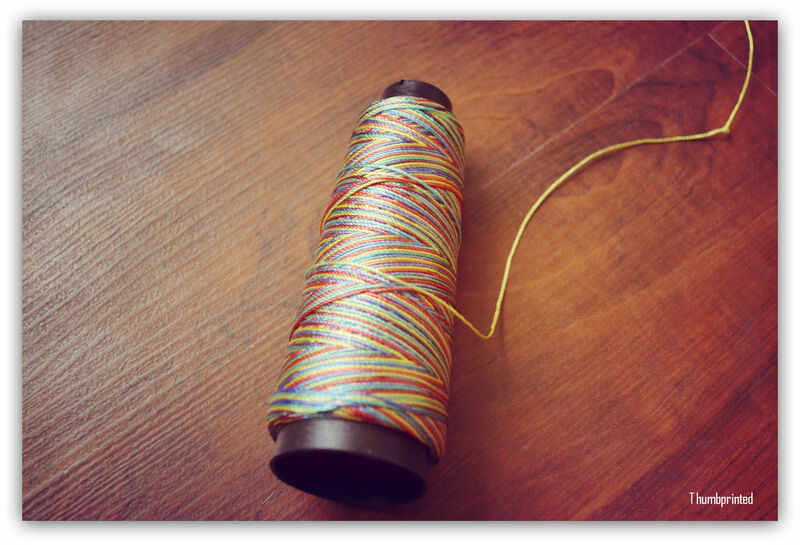 Here I’m going to show you how I did mine with multi-coloured thread. 1. These are the items you will need. 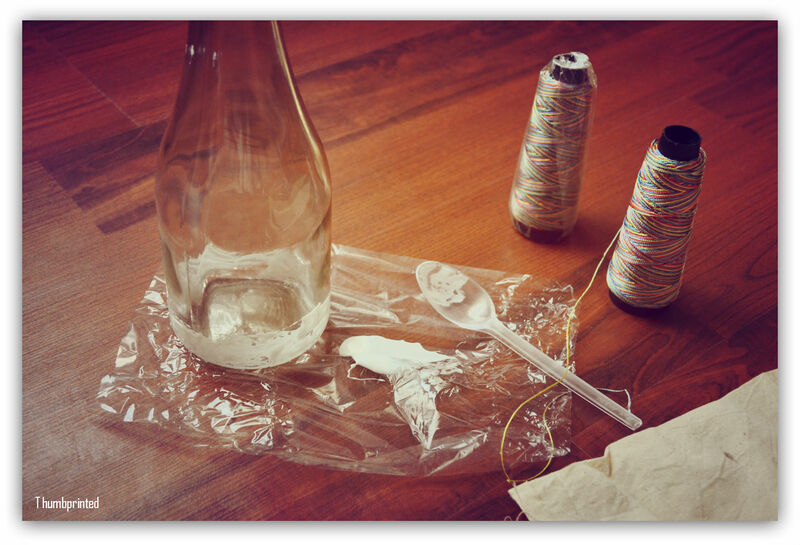 An empty bottle with cap, ring, stickers and dust removed, yarn/thread spools, fevicol or glue, spoon or brush to apply the glue, cloth to clean up excess glue. 2. 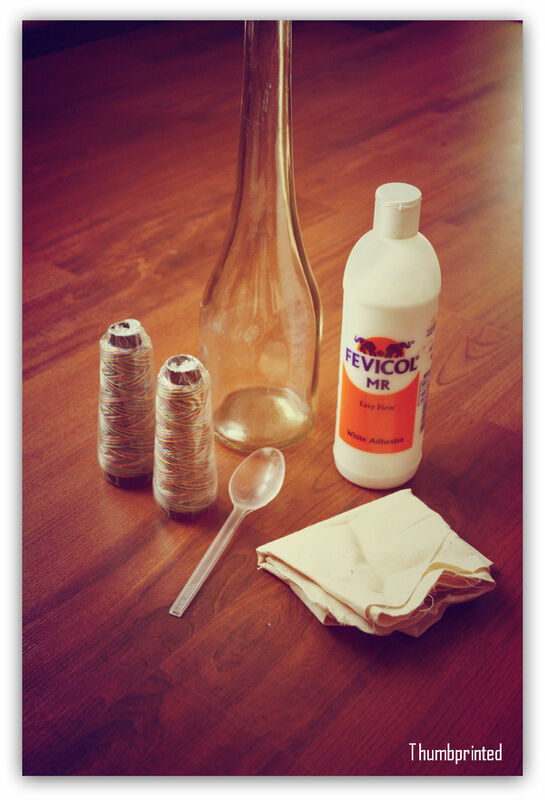 Pour out the glue in a small container or as I have on plastic sheet, and use the brush or spoon to start applying glue to the bottle in parts. You could do this with your hand as well, but I suggest not, as it ends up dirtying the thread with glue as you progress. 3. 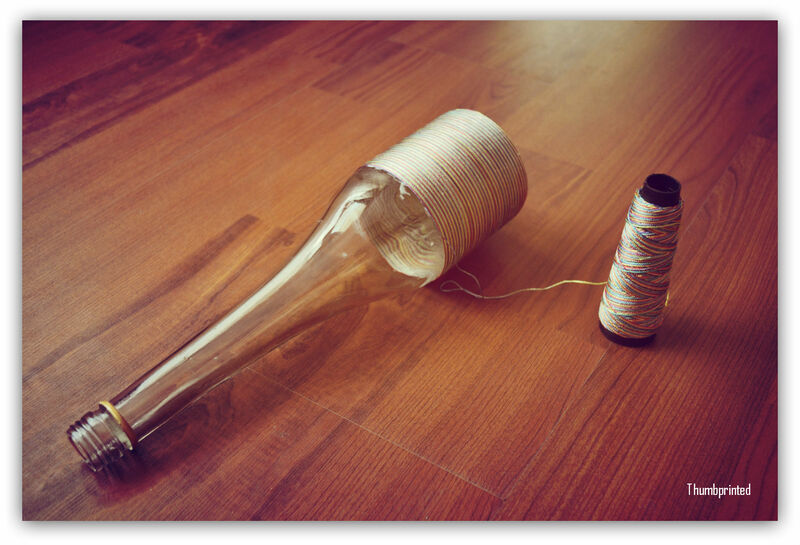 Loosen some thread from the spool, get comfortable to start wrapping the thread slowly around the bottle, starting at the base. 4. 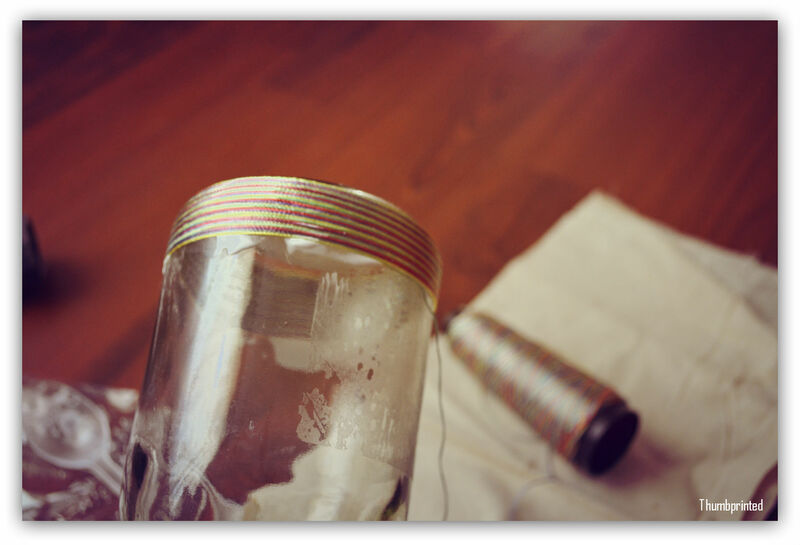 Starting from the base ensure no gaps between the lines of thread and keep wrapping around the bottle, re-applying glue for the fresh areas. 5. The base which in this case is a regular cylindrical shape is easy to wrap without space between threads, but as we reach the base of the neck, you will need to use the back of the spoon to keep pushing the thread back in place without spaces. 6. Keep wrapping all the way to the mouth of the bottle, or you can stop short as in my case, since I plan to have the mouth of the bottle cut, to give it a better look overall. 7. Use a wet rag to clean up the excess glue on the threaded bottle, however wait a day before you do it so you don’t move any threads. 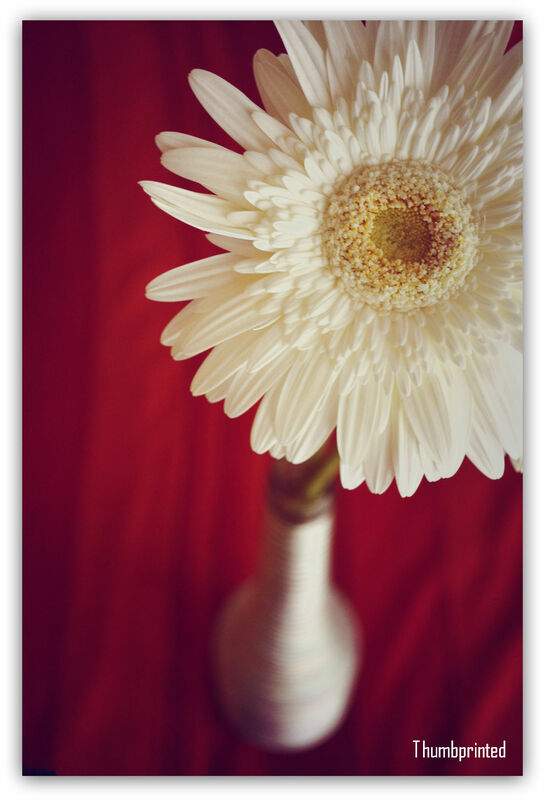 Then use it as you will, to just brighten up a drab corner or have some flowers or a money plat set in them. Hope you enjoyed this simple DIY. Got more ideas? Do share it with me!